NEAL PRESERVE GRAND OPENING! 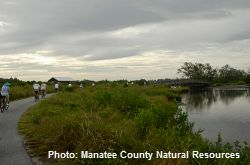 Join Manatee County Natural Resources on April 9, 2014, at 4:00 p.m. to celebrate the opening of this beautiful coastal gem. You're invited to the event which will feature a ribbon cutting, guest speakers, demonstrations of Native American tool use, light refreshments, and naturalist guided tours. Tours will be offered until 6:00 p.m.—Come and join the celebration! Neal Preserve is not currently open to the public.